You know hockey season is close when EA Sports releases the latest edition of their NHL video game. It always seems to make the last stretch of the offseason a bit more bearable. 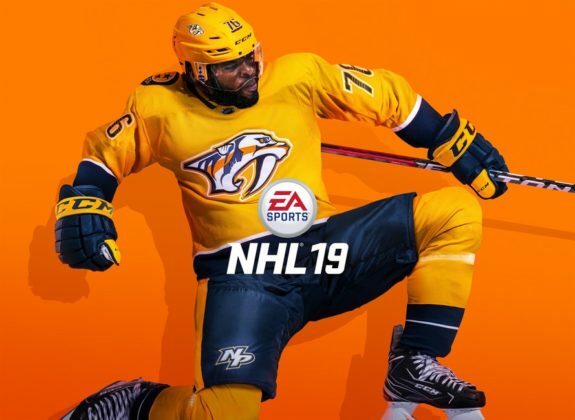 NHL 19 is no different in this regard – it was available to those who pre-ordered the game in an early-access capacity as of Sept. 11, while the game officially dropped on Sept. 14. Fellow THW writer Brandon Share-Cohen (who received the game even earlier than the 11th) and I decided to tackle the review of the popular hockey simulation. This is so that we could approach NHL 19 from multiple perspectives to get, what we feel, is a more accurate rating. We each gave our thoughts on five categories – Gameplay, Mechanics, Presentation, Game Modes, and Replay Value – as well as a rating on a 1-10 scale (10 being the best). Then we combined each of our ratings for these categories for an overall rating of the game. The ratings for gameplay are based on the overall feel of the game when the controller rests in your hands. The gameplay and pace of play feels similar to years past. That isn’t a bad thing, so to speak, as the high ratings in mechanics inherently boost the gameplay due to how life-like everything feels. With any video game, too much realism isn’t a good thing. Fortunately, NHL 19 seems to have found a nice balance between reality and video game and has released an incredible product this time around. For those who have enjoyed the gameplay in the past, the new mechanics will only enhance your experience. For those looking for a boost to the pace of play, it isn’t very noticeable but it’s still very early in the game’s lifecycle. In all, I have no real complaints and I’m not disappointed – I think there is still room for more in the future though. The gameplay in NHL 19 is as fast and furious as ever. Each player seems to perform as expected – smaller players are quicker and more agile while bigger players are able to dish out bone-crushing hits. This is slightly different than past renditions of the games when you could see the likes of, well, just about anyone send 6-foot-9 Zdeno Chara spiraling to the ice. The passing also feels more realistic – pucks sent through the slot, even on an odd-man rush, will likely be turned away. It is also rare that you are able to get the puck to a player who is surrounded by opposing defensemen which has been executed much too easily in the past. There is always room for growth, however. Besides the skating and poke-checking updates (both discussed in the Game Mechanics section of this review) there isn’t a game-changing update is this sector. The artificial intelligence (AI) still seems to have a tough time reacting to what a human-controlled player is doing. When I try setting up an AI-controlled player for a pass, that player often skates into traffic instead of finding open ice. Of course, a computer can’t read your mind, but this is something that hasn’t seen too much improvement since the game jumped to next-generation systems. The game feels just about the same as NHL 18 in terms of how smooth it is, but the mechanics are really where NHL 19 shines. 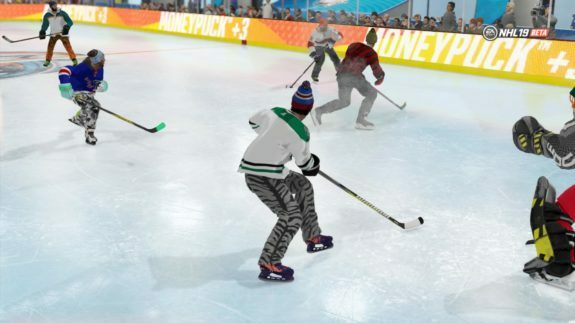 The mechanics rating is based on facets such as skating, hitting, and the overall physics of the game. The only reason mechanics didn’t get a perfect rating out of 10 is because there needs to be some room to go up from here in the future. This is just the beginning of Real Player Motion and while the skating and hitting feel remarkable this year, it’s exciting to think about how this technology can grow and be used in the future. The anticipation that players have prior to hits and the continuation of momentum is incredible in itself. Combine that with each limb being its own independent mechanism in NHL 19 and the hitting feels more life-like than ever before. Combining that type of realism on top of the life-like skating, NHL 19 nailed their mechanics rating this year. Sometimes I struggle giving something a perfect score, but not here. Real Player Motion is the biggest step the series has taken since moving to next-generation consoles. Your player can now stop on a dime, make quick turns, and quite simply looks more realistic than ever. It is a huge breathe of fresh air compared to the skating in past editions of the game in which the movements felt robotic. The stick-checking overhaul is another huge plus. Gone are the days of warping your stick through the opposition’s legs to thwart a scoring chance. If you try to poke check from behind the puck-carrier, you will undoubtedly get a penalty. This is just what the game needed, and I am excited to see what EA can add to the game’s mechanics in the future. Ratings of NHL 19’s presentation are based on how realistic the game looks as well as the atmosphere the simulation places you in. The NHL has so many options in terms of presentation that they can take advantage of. Still, for some reason, the presentation in NHL 19 seems stale and played out. With that said, it isn’t bad, just not innovative or fresh. When the game launched there was hope that they could add something in between whistles, something with commentating, even pre-game things that could add an element of realism to the franchise that we haven’t seen before. While we didn’t get it this year, there’s definitely room to improve moving forward with interactions between players, officials, coaches, and commentators. While NHL 19 feels and handles in a way that is completely different than the game’s predecessors, it looks virtually the same. NBC Sports still provides the game’s coverage but there is really nothing new here. The only update I saw in this regard was a cut-scene of all five of my team’s skaters coming together to pat each other on the head after a goal. Other than that minor detail nothing seems to have changed. The commentating is basically the same and still seems to misfire. I’ve heard the commentators discuss a great save on a shot that hit the post. I’ve also heard lines repeated over and over again within a single game. The arenas, fans, and mascots also failed to receive a facelift. The ONES game mode, which is discussed in-depth in the Game Modes section of this review, gave EA Sports the opportunity to improve presentation – which they did. 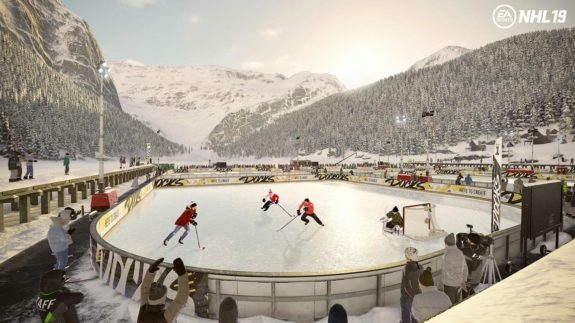 These games take place on outdoor rinks and you can see snowy mountains and trees stretching for what seems like miles, and a commentator on the PA system that can be somewhat cheezy but has the feel of something out of the X Games. Still, I was left looking for much more than I received in terms of presentation. 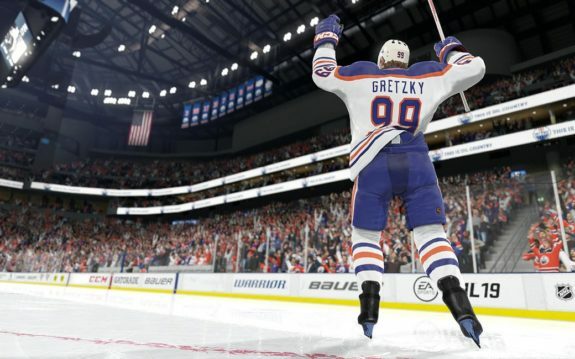 The ratings of NHL 19’s Game Modes is based on the variety of game modes provided as well as their depth. While NHL 19 brings some incredibly fun game innovations in World of CHEL, specifically in the form of ONES, there is still a distinct absence of a story mode in the game that cannot be ignored. The success that EA has had with story mode based careers such as “The Journey,” “Longshot,” and “The One” in FIFA, Madden and NBA Live respectively. The NHL has missed the mark this year due to concentration being spent on other areas. What they’ve done, they’ve done well. Still, the lack of such a story mode leaves a bad taste in my mouth because I’ve had so much fun with that type of mode in each of EA Sports’ other franchises. 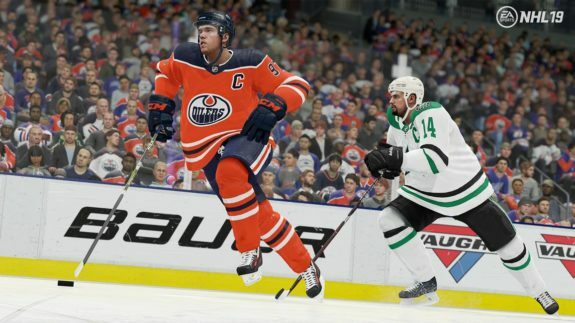 With new additions to Franchise Mode such as the new “Fog of War” mechanic and even a faster-moving simulation setting, though, NHL 19 is still a hit despite their glaring hole in career mode. Be a Pro is still fun and, though it would be nice to have a college hockey or international route instead of just the CHL, an agreement would have to be made between the NHL and NCAA. I’m a huge fan of both the EA Sports Hockey League (EASHL) and Franchise Mode so the additions made to NHL 19 in the game modes compacity are top notch. The World of CHEL mode gives a huge boost to what you can do with your online player. Instead of simply jumping into games with your club, you can play the Pro-AM circuit as well as the Threes and all-new ONES mode. You also have the ability to unlock hockey bags to give your player new traits and gear. The scouting update to Franchise Mode is very in-depth. I spent about a half hour at the beginning of my playthrough assigning my scouts to regions in order to scout specific positions, age groups, and even individual players as you can no longer be certain of the opposition’s attributes. What is lacking for Franchise Mode is online play. Back when the game was played on Xbox 360 and PlayStation 3, EA installed a GM Connected mode that allowed you to create a league that you could invite your friends to. It seemed hard for the servers to handle at the time, but with the power of the new consoles, it seems feasible. Madden 19, for instance, allows you to host your Franchise Mode online and have players join to take on the roles of opposing owners, coaches, and even individual players. Also lacking is an update to Be a Pro mode which, aside from a few bells and whistles, feels like you’re playing a game against the AI with position lock. Hockey Ultimate Team also seems virtually the same other than the average ratings of players being significantly dropped and more NHL legends being added to the roster. The additions EA made to their most popular game modes are right on point. Hopefully next year they can tackle a few of their weaker modes. The Replay Value ratings are based on how likely someone is to continue playing the game after the first handful of playthroughs. NHL 19 is addictive and hard to put down. With the return of so many classic game modes with new ones sprinkled in, the fun is non-stop. Adding in the mechanics as mentioned, the replay value for NHL 19 is at a point where it’s never been before. Getting lost in World of CHEL is easy in itself and that’s just one of many game modes that are sure to get players coming back for more time and time again. EA did a good job with NHL 19 and while they didn’t get a perfect rating from me, there’s a lot to like about this game and a general rating of 41 out of 50 is much higher than I would have given it in previous years. I should preface this by saying I have bought every game of this series since NHL 10 and have owned previous copies beforehand. I’m a pretty dedicated fan of the series, so the replay value for me is always high. One difference with this one is that after the NHL 19 Beta dropped I was unable to return to NHL 18. I played one period of a game and was done. The updates EA made to NHL 19 are simply game-changing. However, in a world in which video games seem to be getting better and more realistic, it is hard to stick to just one game. Even in the early stages of owning a copy of NHL 19, I have spent a large sum of time playing other games. However, I always seem to go back to NHL 19 and will likely continue that trend throughout the hockey season. This brings my overall rating to 42.5 out of 50. With BSC rating the game 41 out of 50 and a rating of 42.5 out of 50 myself, NHL 19 earns a grade of 83.5 out of 100. The mechanics and replay value are very high with this one thanks to the new skating engine and poke-checking revolutions. In other facets, namely presentation, the development team has some work to do as they prepare for their next game. With that said, NHL 19 is the best installment of the franchise to date. If you’ve ever been a fan of the EA Sports NHL series, you’re definitely going to want to check this one out.